GAIN Knob – Controls the amount of input gain and overdrive. 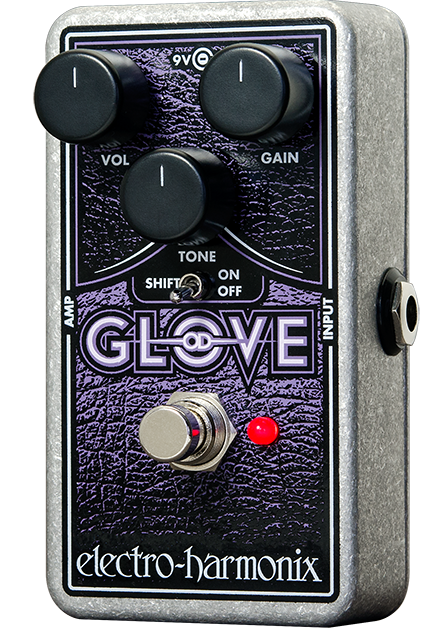 As you turn this knob clockwise, the OD GLOVE ranges from sweet cleans to full-power distortion. TONE Knob – The TONE knob on the OD GLOVE filters out high frequencies. When fully clockwise, the full tonal range of the overdrive comes through. As the knob is turned counter-clockwise, high frequencies are rolled off. Use this to achieve a smoother tone or to reduce any high-frequency harshness. VOL Knob – Sets the output level of the OD GLOVE. TONE SHIFT Switch – This switch controls the mid-frequency emphasis of the TONE knob. Setting this switch to OFF creates a flatter EQ, with some emphasis on low mids. Setting the SHIFT switch to ON emphasizes mids and high mids. There is also a small increase in volume when the switch is set to ON. FOOTSWITCH and LED – The Footswitch selects whether the OD GLOVE is engaged or in true bypass mode. When the effect is engaged, the LED is lit. INPUT Jack – This ¼” jack is the audio input for the OD GLOVE. The input impedance is 300kOhm. AMP Jack – This ¼” jack is the audio output from the OD GLOVE. The output impedance depends on the VOLUME setting, ranging from 12kOhm to 100kOhm. 9V Power Jack – The OD Glove can run off of a 9V battery or you can use an optional 9VDC AC Adapter capable of delivering at least 50mA to the 9V power jack. We recommend the EHX9.6DC-200. The AC Adapter must have a center negative plug. The battery may be left in or taken out when using an AC Adapter. The OD Glove draws 12mA at 9VDC. The maximum voltage that may be connected to the 9V Power Jack is 10VDC. INTERNAL VOLTAGE SWITCH – The OD GLOVE includes an internal slide switch to change its internal power supply voltage from 9V to 18V. Operation at 18V results in a less compressed, more open tone that may work better for some guitar/amplifier combinations. Operation at 9V results in a tighter sound, and reduces the current draw to 5mA. Experiment with the voltage setting at full volume to find the best sound for your playing style. Please remember: do not exceed 10VDC at the 9V Power Jack. The OD Glove generates the 18V internally. To select the operating voltage, remove the four screws on the bottom of the OD GLOVE and take off the bottom plate. There is a slide switch near the input jack labeled “Voltage Select.” Slide this switch to the right for normal 9V operation. Slide it to the left for 18V operation. You do not need to change the battery or adapter when changing the internal voltage. To change the battery, remove the four screws on the bottom of the OD GLOVE and take off the bottom plate. The battery clip is in the bottom of the unit. Take care not to touch the circuit board while changing the battery in order to avoid damaging a component.